Throughout, Dalrymple reacts to the outrageous behaviour of his countrymen in his familiar, cool, philosophical way. He doesn’t revel in the downfall of the poor, as he is sometimes accused of doing. He just observes unsatisfactory human behaviour in an almost scientific way, without feeling the need to sugar the pill. Unblinded by groundless optimism or the desire to be liked, he is a rare voice of truth, attacked by misguided optimists for pointing out the shortcomings of Homo Britannicus. 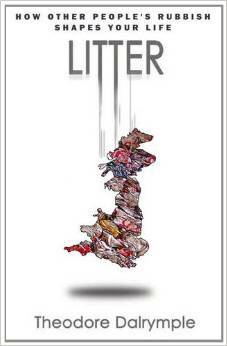 I would certainly urge anyone who has an interest in litter, and in fighting the battle against it, to read this book as it is wonderfully thought-provoking, masterfully expressed and adds a new dimension to current thinking, affording some excellent insights into the psychology of littering and to the change in social habits over the last 50 years that have, without doubt, contributed to making Britain so untidy. Dalrymple leaves us in no doubt as to the magnitude of the challenge that tackling the problem of litter constitutes and is, I suspect, the most successful litter author to date at explaining to us how deeply-rooted in our society is the cause of the litter that most of us are confronted with on a daily basis.